There are still many people who refer to any RIB as a Zodiac, in the same way that an earlier generation called any vacuum cleaner a Hoover. Both of them dominated their market. Neither does now, but after a period in the doldrums Zodiac is well on the way back after an enormous investment by new owners. One of their new designs is the Pro Open Range, the 650 Pro Open being the subject of this review. For the likely tender duties official people capacity is a more than respectable 13, who clearly cannot all fit into the official seats. The side tubes are the unofficial seats; instead of them carrying grab lines laid out in beckets, they have a tight fore and aft line offering far better security. 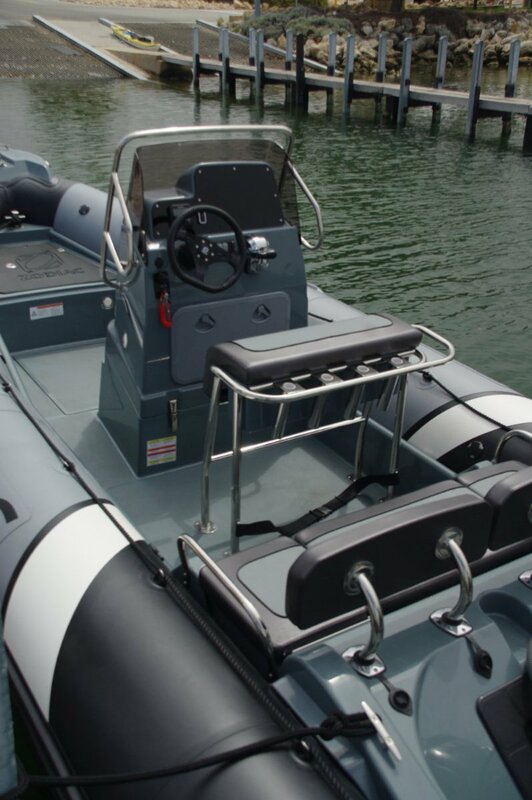 The triple seat aft has a removable pair of backs, their sockets becoming available for rod holding duties. The seat cushion is in three sections, the outer pair mounted above storage boxes. The centre is above a 54 litre esky. To give fishing access, the esky can be moved under the skeleton frame of the driving bolster – Zodiac provides a strap to hold it there. The seat for the driver and navigator is seemingly rudimentary, certainly backless, but it works and has a well placed footrest rail. Where it excels is in its bolster role; it is so well positioned you tend to ignore the seating possibility. Another important task the structure fulfils is to carry a rank of rod holders. The rear seats are first class and provided with excellent hand holds. Things to hold onto are a feature of the 650: everywhere people are likely to sit or stand, there they are. In stainless if there is adjacent fibreglass to anchor it to. The hull is heavier – and tougher - than average, and with a steeper deadrise of 24 degrees. This means a boat that needs a little more power to achieve its speed, although it can produce it through a wider weather range. This is an unusually quiet achiever; very little unwanted sound from the hull at speed. Noise is a producer of fatigue, and apart from that it detracts from the leisure boating experience. Our experience on the day was all good. The buoyant tubes are as tough as it is possible to make them. 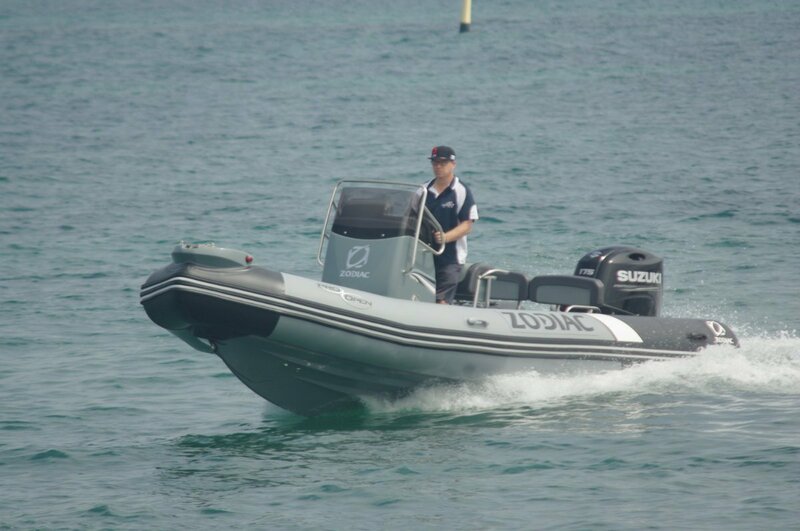 This is a French built boat so naturally it uses the renowned French Hypalon-Neoprene fabric, and in the thickest grade made. The tubes have the priceless feature of being slide-on instead of glued. To remove damaged glued tubes and replace them after repair costs around $3,000. With slide-on it costs about 20 minutes labour. The savings do not end there for owners remote from Perth; only the tubes need to be sent down, not the whole boat. The console features tilt steering, a binnacle mounted throttle and digital gauges. It has abundant room left over for fish finding and navigating electronics, an up market set of which were fitted to our boat. The console can be hinged forward to be roughly level with the top of the tubes, useful for both towing and for tight under cover parking. Hinging exposes an extravagantly roomy under deck stowage compartment; big enough to take a couple of sets of scuba gear. Just ahead of the hinge is the deck plate over the fuel tank – easily removed for fuel system inspection. Ahead again is the bow platform with anchor locker and removable storage bin below. The motor fitted was a 175hp Suzuki four-stroke, the maximum permitted power. It was good for a little over 40 knots, so most buyers would be happy to save some dollars and drop to the more usual 150hp. Naturally our motor had hydraulic steering giving us fingertip control. Provision for anchoring is limited to a polyester bow roller, the anchor locker and a bollard – which of course is all you actually need.